Field sales is no longer necessary in the way it once was because communication has improved. At one time customers relied on salespeople for information about not only the vendor but also industry trends. Conversely, vendors relied on their salespeople to learn about changes in their market and customer needs. Customers today no longer need salespeople to perform these communication functions. Industry trends are available from a variety of sources. Vendors post lots of information on their website about products, pricing, and usage case studies. Many customer questions can be answered with a question via text messaging or a quick phone call. No need for a salesperson to visit the customer. These trends support the case that field sales is dying and inside sales is replacing it. The economics of customer acquisition also support the argument for the transition to inside sales. 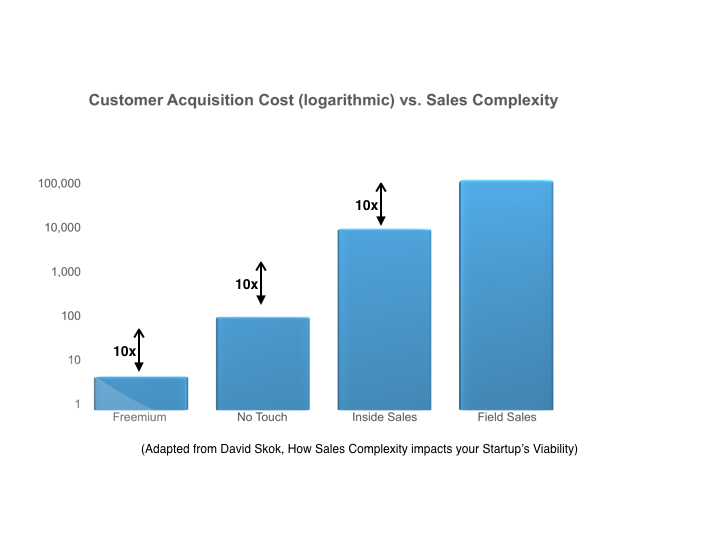 David Skok divides the four methods of selling software-as-a-service (SaaS) in order of complexity from Freemium to No Touch (online e-commerce), Inside Sales and Field Sales. He has stated that he expected to find a linear relationship between the complexity of these four methods and Customer Acquisition Costs (CAC). However, he found in his own informal review of different companies that the relationship between CAC and sales complexity is not linear at all. What we see is something quite surprising: using the rough numbers that I had estimated for these different categories, CAC appears to increase exponentially as Sales Complexity increases. This logarithmic relationship creates a tremendous incentive to conduct as many transactions as you can using either No Touch or Inside Sales. And it supplies a strong economic motivation to avoid Field Sales except where it’s absolutely necessary. How Does the Sales Process Look to the Customer? To understand more clearly how this vendor-customer dynamic has changed, Roff-Marsh suggests we look at the situation from the customer’s perspective. Ask yourself the following: If you are making a purchase (of an unspecified nature), is your default starting point to look for a person who can come and visit with you in the field? I suspect not. For most of us, our first instinct is to make the purchase with no human intervention at all, like on a website. If that isn’t possible, then we’ll still opt for minimal human communication—by phone or by visiting the place of business ourself. Our last choice will be for the field person to come to our home or office. Even for a complex purchase (like something that must be built-to-order), we’ll begin with online research, and then perhaps we’ll pick up the phone to ask some questions. It’s only if it’s very complex that at the late stage of the buying process that we’ll agree to meet with someone in person. Roff-Marsh makes a clear argument that No Touch communication and Inside Sales are the preferred way that customers today want to buy. Fortunately for sellers, these methods are also dramatically less expensive than deploying salespeople in the field.